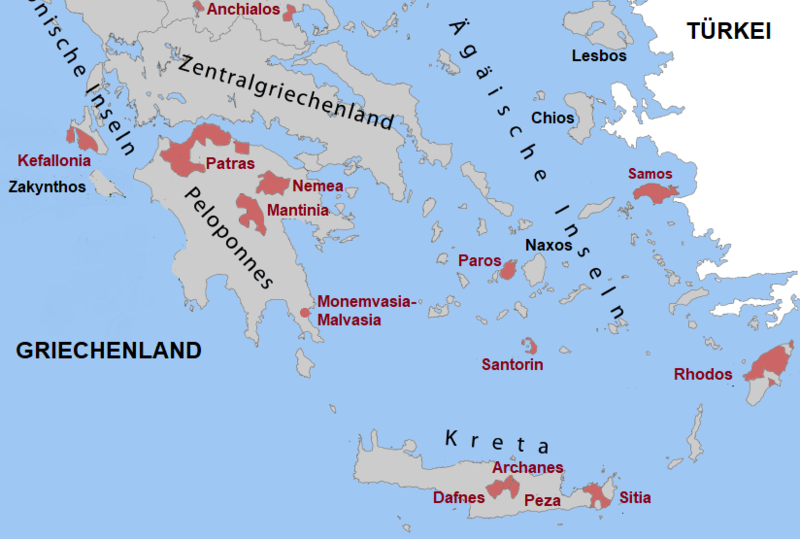 In the south of the mainland of Greece located peninsula with about 21,000 km² (new Morea); The name means after a mythological figure "island of Pelops". It is completely separated from the mainland by the 1893 artificially constructed over six kilometers long narrow channel of Corinth. Here are the strongholds of ancient culture such as Epidaurus, Mistra, Mycenae, Olympia (the site of the ancient Olympic Games) and Sparta. Already in the antiquity There was a flourishing wine culture here. At the southwestern tip lies the port city Monemvasia which in the Middle Ages was a famous hub for sweets Dessert wines was and of which is the name used for many grape varieties or wines Malvasia derives. In 2010 was the fourth POP -Appellation Monemvasia Malvasia created and revived the historic sweet wine. In the Peloponnese, about a quarter of Greek wine is produced. In large quantities will be too table grapes and raisins (Currants) produced as an important export article. These vineyards are located mainly along the coast of the Gulf of Corinth and the Ionian Sea. The climate is very different, in the west there is abundant rainfall, in the east, however, long dry periods with little rain. This page was last modified at 19 September 2018 at 14:29.